Friends of Kids with Cancer | Help 'Friends' and purchase a FollowMeFairy! The holiday season may be over, but Friends of Kids with Cancer works to help our kids year-round! Purchase a Follow Me Fairy and 'Friends' will benefit from the proceeds! A Fairy Doll & Backpack that is Six Gifts in One! A gift that develops imagination & creativity for girls 3-8! 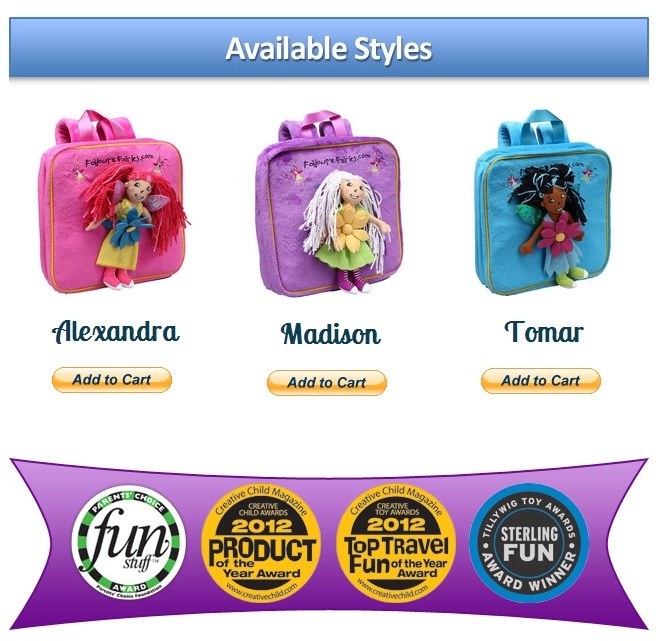 The Follow Me Fairies ® Activity Pack is a plush child-sized backpack complete with an adorable removable fairy and a variety of fun play items. On-the-go playtime has never been easier for busy parents. Place the fairy right in the holder on the backpack, and your child will be instantly ready to leave the house for a happy travel playtime experience! Click HERE to see more reviews and order a Follow Me Fairy today!